← Chocolate Chia Seed Pudding – A Healthier Tapioca Pudding! I hope everyone is having a relaxing Sunday. Before I share my recipe for my favorite Asian stew with you, I thought I’d give you a little humor. Luke took this video of Teddy in the snow the other night. He loves to eat the snow – and we think that’s what he’s doing – but who knows! He is such a weird dog sometimes :). The end is the best part if you want to fast forward! His snow face at the end is priceless! 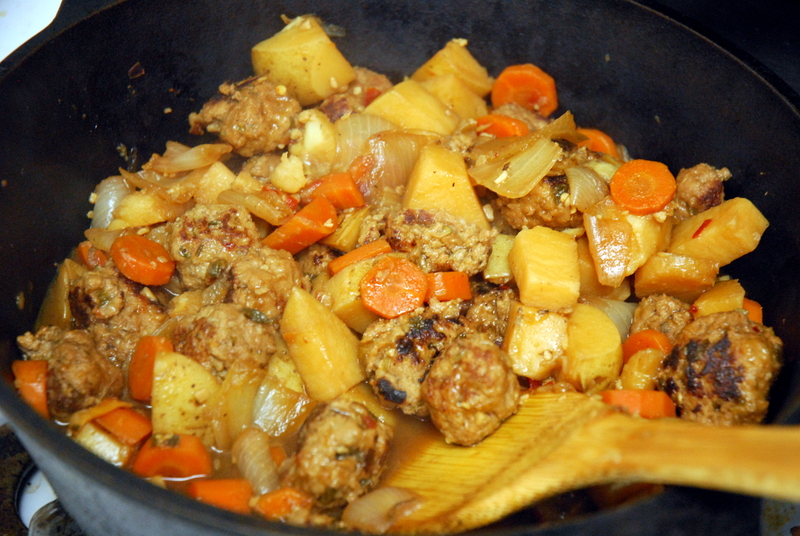 So for dinner last night, I made one of my all time favorite Asian recipes – Sweet “N Spicy Korean Stew. I originally used a recipe from allrecipes.com, but I’ve changed it and tweaked it so much since then that it’s pretty much a whole new recipe. It is extremely tasty, and pretty healthy when you factor in all the delicious veggies. I added parsnip for the first time last night (just because we needed to use some up in our fridge) and it worked wonderfully, though you don’t have to add it if you don’t have any. Carrots, potatoes and onions are the staple veggies. We also added turkey meatballs instead of our usual chicken last night, and I think we will do that from now on because we loved it even more that way! We used leftover meat from our Tasty Turkey Burgers to form the meatballs, so feel free to use that recipe for your meatballs. Also, if you don’t like too much spice in your dishes, you might want to scale back on the sambal olek (chili paste). The dish comes together pretty fast – you just have to let it simmer for a while! First add all of your veggies and sugar to a pot over medium heat and toss together. 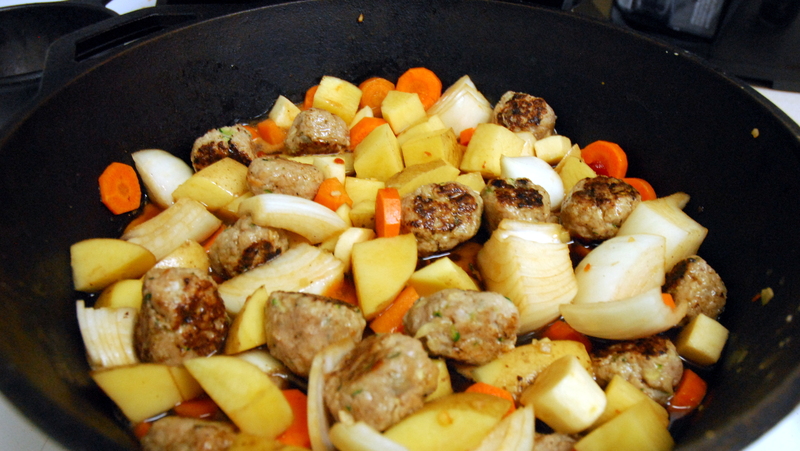 Then add the water, soy sauce, chili paste, and meatballs (or chicken) and stir together. Bring to a boil, reduce to a simmer and cook covered for 30-45 minutes. 1) Form and cook your turkey meatballs over medium heat on an oiled pan, flipping every couple minutes. OR, if using chicken, cut your chicken into bite size pieces (no need to cook chicken). 2) Chop your carrots, parsnip and potatoes into bite size pieces. Chop your onion into 8 pieces. Mince your garlic if you need to. 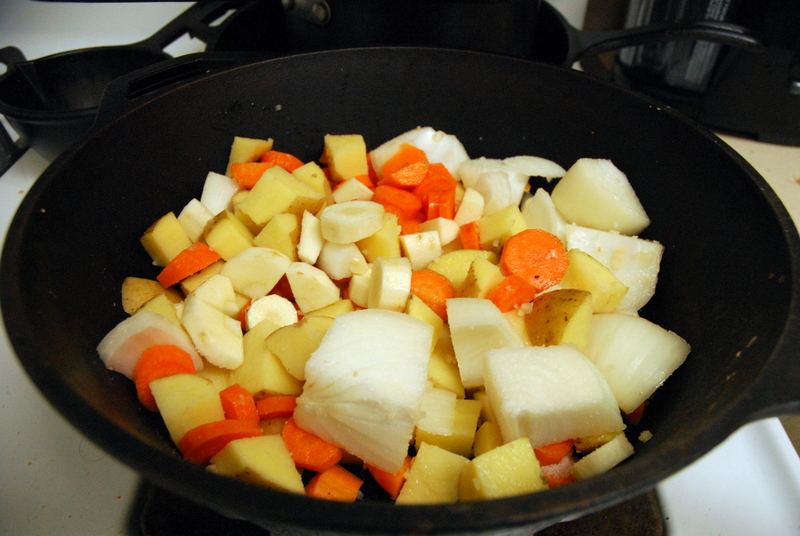 3) Throw your carrots, parsnip, potatoes, onion, garlic, and sugar into a big pot over medium heat and toss together. 4) Add the soy sauce, water, and chili paste to the pot and stir to combine. 5) Bring to a boil. 6) Reduce to a simmer and cook, covered, for 30-45 minutes – until liquid has thickened and veggies are your desired tenderness. 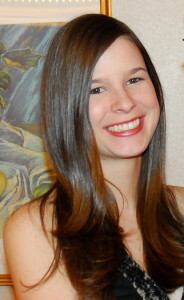 This entry was posted in Asian, Recipes, Teddy and tagged asian, dinner, korean, soup, spicy, stew. Bookmark the permalink. You should teak this to make bokkeumtang, korean spicy stew, by marinating your turkey or chicken in cooking wine, salt & pepper. Also add sesame oil, sugar, corn syrup, sesame seeds, and cooking wine to your sauce. You can replace your chili paste with hot red pepper powder for an authentic version. Sugar & corn syrup will add the sweet flavor that your looking for.